BERNABE, Anna and BALDI, Cristina and CONTARINI, Marina and IANNUCCI, Paola and SEBASTIANIS, Landina (2017) The University of Ferrara (Unife) Libraries unveil their heritage to fulfill new goals: completed actions, plans and opportunities supporting Research, Education and Third Mission. Paper presented at: IFLA WLIC 2017 – Wrocław, Poland – Libraries. Solidarity. Society. in Session 112 - Poster Sessions. The Libraries of the University of Ferrara (Italy) make great efforts to help their parent University in pursuing the strategic goals related to Education and Research, as well as its commitment in the social, cultural and economic development of society (Third Mission). 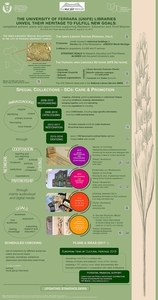 A specific strategy was then worked out by focusing on care and promotion of special collections, which are not only unique and therefore able to identify the holding institution but also fascinating and often of local interest. The strategy is displayed on the left handside of the poster: taking the opportunities provided by relevant networks - like Ferrara area Libraries - as well as by cooperation, synergy and partnership with other public institutions or private entities, since 2008 the Unife Libraries have been trying to make internal and external stakeholders aware of the heritage and its value and to outreach and engage new audiences, also non-academic. 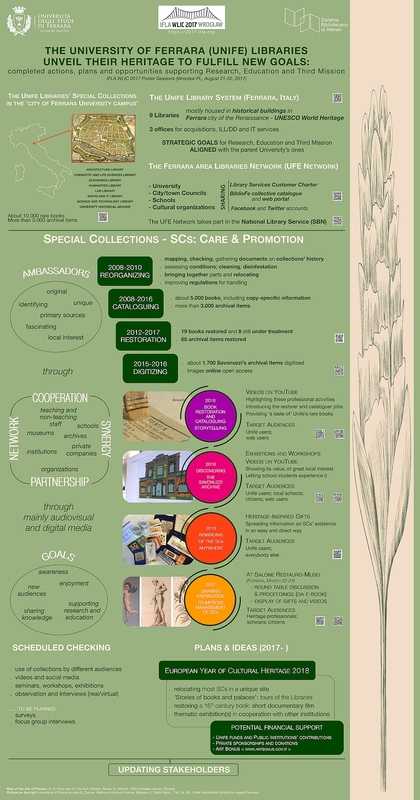 The central part of the poster highlights the most important activities already completed, followed by the ongoing and planned ones, which may involve non-public partners too: cataloguing, restoration and digitization, promotional activities have been undertaken or scheduled (short documentary videos, exhibitions, workshops, heritage-inspired gifts, a Round Table and its proceedings, initiatives related to bibliotourism). Actions are mostly realized thanks to digital and audio-visual technologies and their results are always available Open Access for the benefit of any citizen; QR-codes linking to web contents are provided. Furthermore, the Unife Libraries check actions’ effectiveness, in order to plan new steps, communicate the activities to stakeholders and keep them updated about their development. Finally, on the poster’s right handside, the reworking of an 18th-century plate by a local artist is an example of new contents created thanks to “re-reading” the heritage by means of the user’s cultural background.